DuPont Pioneer has announced the winners of its fourth annual Ontario Corn Yield Challenge (OCYC). The 11 seed growers with top-performing Pioneer® brand hybrids accepted their awards, networked, and shared agronomic practices with contestants and their guests at an awards event in January. A record 453 growers from across Ontario took on the challenge this year. The 11 winners represent different maturities across Ontario and while there is no overall winner because of the differences in heat unit regions, the highest yield attained was 327.1 bushels/acre by Randy Vandeheede of Simcoe, growing Pioneer® brand hybrid P1184. • Randy Vandeheede (Simcoe, Ont. ): 327.1 bu/ac, P1184. Valent Canada Inc. recently announced that Nufarm Agriculture Inc. has been appointed the exclusive distributor of Fierce™ herbicide in Canada. 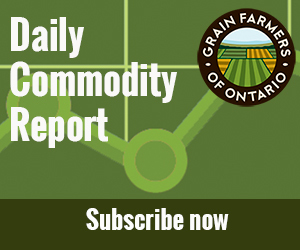 Fierce herbicide, containing new chemistry Group 15 (pyroxasulfone) with proven chemistry Group 14 (flumioxazine), was registered for Canadian soybeans in January. Fierce offers a residual and broadest spectrum weed control in both glyphosate-tolerant and IP/conventional soybeans in Eastern Canada. “To maximize soybean yield potential, growers require a product that controls tough grass and broadleaf weeds and provides lasting residual control,” says Blair Bossuyt, Nufarm’s Eastern Canadian sales manager. Fierce offers Canadian soybean growers an innovative weed control solution that doubles as an effective tool for resistance management. Farm & Food Care, in partnership with the University of Guelph, is pleased to be supporting a symposium featuring results from the Water Resource Adaptation and Management Initiative (WRAMI) of 2013. The results of several WRAMI projects will be released at the event on March 6, 2014 at the Holiday Inn in Guelph. The symposium will feature talks from nine WRAMI participants and partners and a poster display session. The keynote address will be given by Chris Kinsley, Manager of the Ontario Rural Wastewater Centre. If you have an interest in water saving and conservation programs, practices, and technologies, you should plan to attend this forum. The program will be of special interest to students, researchers, extension professionals, and agronomists.